In my opinion, they are the best dogs in the world! A Goldendoodle is a mixed-breed, a cross between a Golden Retriever and a Poodle. The name Goldendoodle was coined in 1992 by combining “Golden”, from Golden Retriever, and “doodle” from the standard poodle. Poodle hybrids have become increasingly popular and it is likely that the combination of Golden Retriever and Poodle has been duplicated by breeders in various countries at different times. Standard poodles are referred to as the second smartest dogs in the world. Golden Retrievers are the fourth. 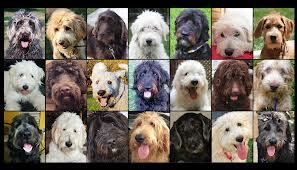 Goldendoodles are not only intelligent, but are sweet and loving and have their own individual personalities. They are great for families with allergies. 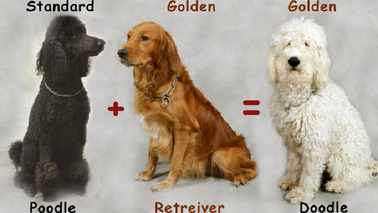 Do you understand the differences between all golden doodles? Golden Retriever X Poodle (50% Poodle / 50% Golden Retriever) = Some will shed little to none, while others a bit more, but nothing like a Golden. Allergy Friendly. F1 Goldendoodle X F1 Goldendoodle (50% Golden /50% Poodle) = Some will shed a little to none , others a bit more, but nothing like a Golden. F1 Goldendoodle X F1B Goldendoodle (62.5% Poodle / 37.5% Golden Retriever) = The most curly ones usually do not shed (similar to an F1B)--Straighter ones will shed like an F1. F1B Goldendoodle X F1B Goldendoodle (75% Poodle / 25% Golden Retriever) = The most curly ones usually do not shed (similar to an F1B) --Straighter ones will shed like an F1. F2B Goldendoodle X F2B Goldendoodles (62.5% Poodle / 37.5% Golden Retriever)= The most curly ones usually do not shed (similar to an F1B) --Straighter ones will shed like an F1. F2B Goldendoodle X F2 Goldendoodle (45% Poodle / 55% Golden Retriever) = The most curly ones usually do not shed (similar to an F1B) --Straighter ones will shed like an F1. F1B Goldendoodle X English Golden Retriever (60% English Golden / 40% Poodle) = Some will shed a little to none, while others a bit more, but nothing like a Golden. Least Allergy Friendly. 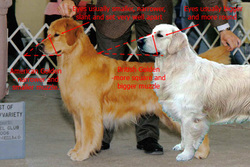 Characteristic differences between American and English Golden Retrievers is foreface and muzzle. AKC standard wants the muzzle to be straight but also states the foreface should be nearly the length of the skull. This resulted in smaller muzzle and more conical shape. Despite its more laconic form KC standard is more precise. It wants the length of foreface to be approximately length stop to occiput. English Goldens have bigger and wider muzzles which influences stronger jaws. The temperament of the Golden Retriever is a hallmark of the breed and is described in the standard as "kind, friendly and confident." They are not "one man dogs" and are generally equally amiable with both strangers and those familiar to them. Their trusting, gentle disposition makes them a poor guard dog. Any form of unprovoked aggression or hostility towards either people, dogs or other animals, whether in the show ring or community, is completely unacceptable in a Golden Retriever and is not in keeping with the character of the breed and as such is considered a serious fault. Nor should a Golden Retriever be unduly timid or nervous. The typical Golden Retriever is calm, naturally intelligent and biddable, with an exceptional eagerness to please. Whether the object is a thrown stick, tennis ball, or flying disc, retrieving can keep a dog of this breed occupied and entertained for hours, particularly if water is also involved. Goldens might also pick up and "retrieve" any object that is near to them upon their masters' arrival, all of this lending to their retriever name. Golden Retrievers are also noted for their intelligence, and can learn up to roughly 240 commands, words and phrases. The Golden Retriever ranks 4th in Stanley Coren's The Intelligence of Dogs, being one the the brightest dogs ranked by obedience command trainability. These dogs are also renowned for their patience with children. The Poodle is a breed of dog. The Standard Poodle is regarded as the second most intelligent breed of dog after the Border Collie, and before the German Shepherd Dog. The poodle breed is found officially in toy, miniature, and standard sizes, with many coat colors. Originally bred as a type of water dog, the poodle is skillful in many dog sports, including agility, obedience, tracking, and even herding. Poodles have taken top honors in many conformation shows, including "Best in Show" at the Westminster Kennel Club Dog Show in 1991 and 2002, and at the World Dog Show in 2007 and 2010. 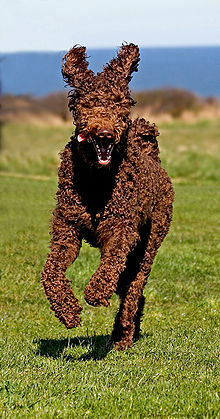 Poodles are retrievers or gun dogs, and can still be seen in that role most of the time. The American Kennel Club states that the large, or Standard, Poodle is the oldest of the three varieties and that the dog gained special fame as a water worker. So widely was it used as retriever that it was bred with a moisture-resistant coat to further facilitate progress in swimming. All of the Poodle's ancestors were acknowledged to be good swimmers, although one member of the family, the truffle dog (which may have been of Toy or Miniature size), it is said, never went near the water. Most poodles have a curly, non-shedding coat that requires regular grooming. Since poodles do not have the plush double coat of many breeds, their fur is often referred to as "hair", a term usually reserved for humans. Most poodles are solid-colored, and many registries allow only solid colors in conformation shows. Unlike most dogs which have double coats, poodles have a single layer (no undercoat) of dense, curly fur that sheds minimally.They could be considered hypoallergenic. The poodle's individual hair follicles have an active growth period that is longer than that of many other breeds of dogs; combined with the tightly curled coat, which slows the loss of dander and dead hair by trapping it in the curls, an individual poodle may release less dander and hair into the environment. In addition, most poodles are frequently brushed and bathed to keep them looking their best; this not only removes hair and dander but also controls the other potent allergen, saliva. Poodles are extremely people-oriented dogs and generally eager to please. Standard poodles in particular tend to be good with children. Poodles are adaptable and easy to train, but sometimes their intelligence can make them obstinate and stubborn. Like most dogs, they appreciate daily exercise, such as a walk or a play session. Most are fairly agile and athletic. Poodles are very easy to housebreak. Whether going outside or being trained on a pad, they learn quickly where to defecate. They are still animals, however, and they need time to understand what is desired of them. It may take a while, but poodles are quite smart and learn more quickly than most dogs.